Earl Benedict Macasaet, CPA | Earl Benedict Macasaet, CPA Inc.
Earl Benedict Macasaet founded his CPA practice, Earl Benedict Macasaet CPA, Inc. in 1994 with the vision of creating a firm that provides high quality accounting services and solutions for individuals, families and business clients, with a strong focus on building long term and successful business client relationship. With prior accounting and leadership experience in a variety of client and business industries, Earl is focused and passionate about making the firm a great place to work for and an even better company to do business with. Before founding his own CPA firm, Earl served in a variety of capacities where he was responsible for the preparation and review of Financial and Compliance Audit reports for government non-profit/for-profit entities under the Departments of Education (Federal & California), Health, Housing and Urban Development (HUD), and Labor, as well as various county and city agencies. Earl now specializes in the preparation of Medicare Cost Reports and Income Tax Returns (Corporate, Partnership, Individual, Non-Profit, Sales, and Payroll. Earl also represents clients during governmental audits by Medicare, the Internal Revenue Service (IRS), the Franchise Tax Board (FTB), the Employment Development Department (EDD), the State of Board of Equalization, and the Office of the Inspector General (OIG), as well as client hearing before the Department of Health and Human Services. He has worked hard to build a strong team that serves his clients well and that has enabled the firm to enjoy its steady growth and success. 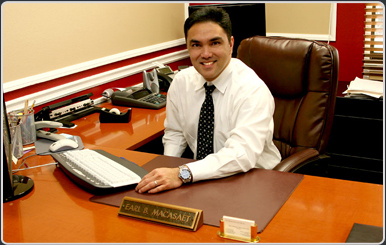 Earl Benedict Macasaet is an active member of AICPA and the California Society of Certified Public Accountants.